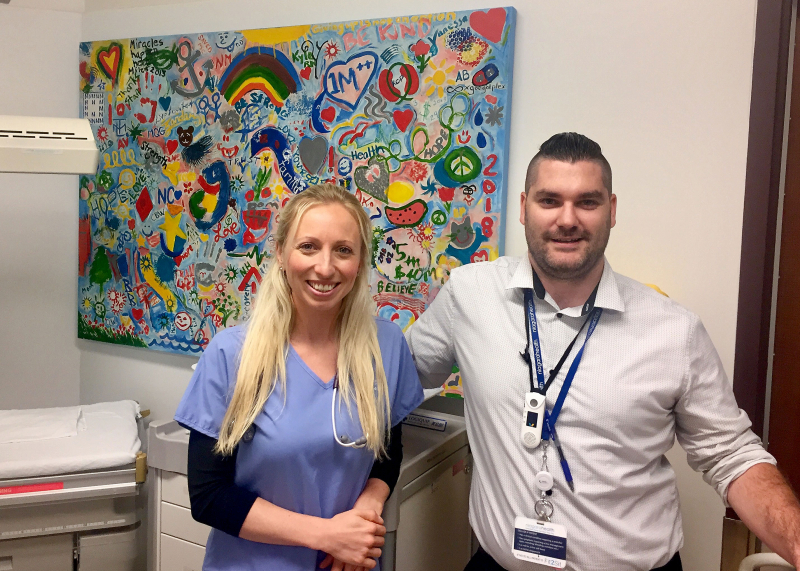 A community art project is helping to brighten the spirits of our youngest patients at our St. Catharines Emergency Department. Niagara Health patients, visitors and team members contributed to a painting for the fifth birthday celebration of our St. Catharines Site in March. They were encouraged to make a stroke, swoosh or anything they were inspired to paint on the canvas to help us mark the March 24 birthday and the first five years of our journey to create a Healthier Niagara. The painting was then left in the hands of St. Catharines artist Helen Michlik who added final brush strokes to connect all of the unique designs. The finished product is now displayed in the Pediatric Trauma Room at our St. Catharines Emergency Department. "The painting provides a bit of a distraction for our younger patients and helps them feel a little more comfortable," says Brandon Douglas, Clinical Manager of the St. Catharines Emergency Department. "It puts a positive spin on the situation they’re going through. And we’re telling the story all the time about how the painting came to be." The painting features inspirational messages like "Road to recovery, giving up is not an option, love yourself and be kind and smile."